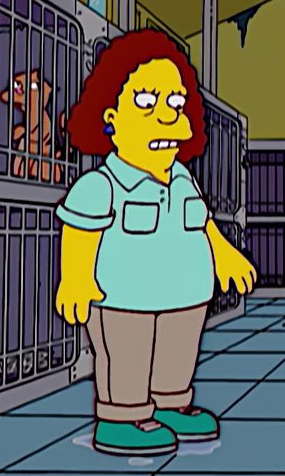 The Springfield Animal Shelter employee is an employee at the Springfield Animal Shelter. After Lisa had adopted two cats from the Animal Shelter, both of which died, she and Marge returned to the Animal Shelter. The employee, however, told her that she couldn't adopt any more cats because they would rather take their chances in the back room than go home with her. When Marge told Lisa that she'd get her a puppy, they went back to the Animal Shelter where the employee told Lisa that it would be cuter to pick a dog without talking to her. Lisa then went back to get another dog who she didn't pick because she wanted a cuter dog. The employee then guilted Lisa into taking home Smiley and Henry the Canary too. Modified on March 14, 2018, at 11:35.